In compliance with a non-binding Cambridge City Council resolution written in May, the administration has extended MIT's non-smoking policy to campus dining areas effective Sept. 1. 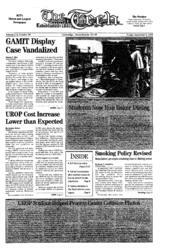 The smoking policy, which has been in place since March 1987, continues to prohibit smoking in all academic and service buildings, except in dormitories, said Senior Vice President William R. Dickson '56. Previously, this policy also allowed designated smoking sections in eating areas, including Walker, Lobdell Court, and Networks, Dickson said. Under the newly revised smoking policy, these areas are eliminated, he said. However, dormitories are still allowed to have their own policies regarding smoking, Dickson said. "Any food service operation used by the community is affected [by the revised policy], except those in the residence houses," said Director of Housing and Food Services Lawrence E. Maguire. The revised policy reads: "This policy is intended to be self-enforcing and the cooperation of all members of the MIT community is expected." No one has complained about the new ordinance, Maguire said. "I haven't had one comment; everybody seems to agree that it's the right thing to do," he said. Christian T. Powers G, who smokes, said that he is not bothered by not being permitted to smoke in dining facilities. "I'm used to not being able to smoke in public areas," he said. Networks Manager Dalton DaSilva said that so far no smokers have complained to him about the new policy. Smokers tend to sit at the tables outside of Networks, he said, but he is not sure what they will do during the winter. "I think [the policy] is a good idea," said Enrique Barajas '97. "Maybe it should be expanded to dorms" so that people can just smoke in their rooms and not in the halls, he said. Barajas, a resident of Burton House, said that he does not mind when people smoke in the hall occasionally, "but when someone's constantly smoking I do mind," he said. David L. Middleton '97 said that before, "during lunchtime you could smell [smoke] a lot. � Smoking does tend to bother me, but I'm not one to complain." In a memorandum written to the MIT community in late August, Dickson said that since the 1987 policy was instated, "the dangers of smoking, including the ingestion of second-hand smoke, have been increasingly well documented by the medical community." "In recognition of this fact, in May 1994, the Cambridge City Council enacted a resolution urging that Cambridge become a �smoke-free' environment in the workplace and in restaurants," according to the memorandum. Dickson said that administrators were discussing the new provision before the Cambridge City Council passed their resolution. Though the resolution was not binding, MIT decided to follow the recommendation, he said. "It's done in the spirit of the Cambridge ordinance," Dickson said.